This article details the use of the Orca. For ship stats and other mechanical information, see Orca. For fittings, see Orca/Fittings. The Orca is a mining support ship, classified as an Industrial Command Ship. 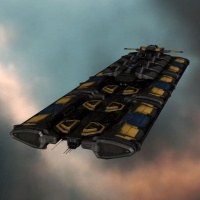 The Industrial Command Ships (8x, 55M ISK) skill is required to fly it. Note that even though it is listed under "Capital Industrial Ships" in the EVE market, it does not require the Capital Industrial Ships skill. Cargohold: The Orca's base cargohold is 30,000 m³, which can be expanded through modules and rigs. The cargohold also receives an additional 5% bonus to size for each level of Industrial Command Ships. Maxed out for hauling, an Orca can fit over 90,000 m³ in its cargo hold. This is the only hold on the ship that receives bonuses from modules and rigs. Ore Hold: As its name suggests, the ore hold can contain only mined materials (unrefined ore, ice and gas). Attempting to move modules or anything else into the ore hold will result in an error message. The ore hold receives a 5% bonus to size for each level of Industrial Command Ships. added to its base 150,000 m³. Fleet Hangar: The fleet hangar holds 40,000 m³ and can be made available to other fleet members or members of the pilot's corporation for access in space. This is very useful for supporting mining operations, as mining fleetmates can then use the fleet hangar to store mined ore or ice. The Orca pilot can then move that ore or ice to the ore hold or cargohold, or leave it in the fleet hangar, as space permits. To allow access the ship maintenance bay, the Orca pilot must set access for fleet members or corporation members or both. If a fleet member wants to switch ships in space, they can open the ship maintenance bay, right click the ship they want to use, and choose either “Board Ship from Bay” or “Launch Ship from Bay.” The "Board" option is safer – it stores the pilot's current ship in the bay, and puts them into the new one in space. It’s only available if there is enough room in the bay to store the new ship minus the old ship. Otherwise, pilots must choose the Launch option, which leaves their current ship abandoned in space, and puts them into the new one. As with any abandoned ship, this could potentially enable theft. Besides being able to swap ships, the Orca has a fitting service, so pilots can refit their ships while in space. To access this function, right click on the Orca while within 2500m to choose to "Use Fitting Service". Pilots can swap fittings that are in the cargohold of their own ship, or they can pull fittings out of the Orca’s bays. Drones can also be swapped in and out of a ship's drone bay. The Orca receives two large role bonuses to Tractor Beams: a 250% bonus to range, and a 100% bonus to beam velocity. Both bonuses are helpful, but since most pilots usually only fit one Tractor Beam at most, the range increase is the most noticeable of the two. Orcas equipped with Tractor Beams can serve as storage for a fleet's ore, or the Orca pilot can leave the jetcans in space for other hauler ships to pick up in a central location. Orcas can also combine Tractor Beams with Salvagers to loot and salvage the wrecks of any belt rats that may spawn. Survey scanners on an Orca receive a 500% role bonus to range, so Orca pilots are able to see how much ore is in every rock in over a 100km radius. This allows the Orca pilot to easily tag asteroids to mark those that are full or nearly empty, and better coordinate the miners. The Orca is capable of boosting fleets is using Command Bursts in its high slots. By default, it can equip and use three Command Bursts simultaneously, and this can be expanded to five Command Bursts with the use of two Command Burst Processor Rigs (150 calibration each). For most mining operations, Orcas pilots will want to bring all three Mining Foreman Command Burst charges, though some Orca pilots will forgo the Mining Equipment Preservation charge. Shield Command Bursts are not always necessary, particularly if the mining fleet is in higher-security space. Given the massive hull tank of the Orca, adding a Damage Control II (adds uniform 60% resists to structure HP) and a Reinforced Bulkhead II module (increases structure hit points) will give the Orca a formidable tank. Adding a 500MN Compact Microwarpdrive (for fitting purposes) and shield tank modules will allow an Orca to easily achieve 200k+ EHP, with the additional ability to align in 10 seconds (one cycle of the MWD). With Transverse Bulkhead rigs (increases structure but lower cargo hold capacity) the tank can be pushed well above 400k ehp. If more tank is unnecessary or unwanted, Hyperspatial Velocity rigs (higher warp speed but lower CPU capacity) or Cargohold Optimization rigs (increases cargo hold but reduces armor) can also be useful. The Orca has some disadvantages in a mining op. First, it's a pilot that could be mining, assuming they have the skills. For example, if the Orca pilot has the skills they would need to fly a Hulk, they would need to be boosting four miners to be worthwhile in terms of yield over mining themselves. This is because an Orca with full bonuses ( Industrial Command Ships V, Mining Director V, Warfare Link Specialist V, Mindlink Implant) would have roughly a 25% bonus to each activated mining link. With the November 2016 Ascension update the Orca saw a drastic change in its ability to contribute to a mining op. Off-grid boosts were eliminated in favor of the new Command Burst system, and the Orca was given drastically increased mining and defensive capabilities. According to the dev blog describing the changes to the Orca: "With both skill and role bonuses to mining drone yield, the Orca can pull in similar ore volumes to an Exhumer." Post-Ascension, the Orca's ability to store and haul ore has been greatly increased. With Industrial Command Ships V, the Orca's ore hold alone can hold 187,500 m3 of ore, which is roughly equivalent to a pre-Ascension Orca's total ore capacity across all holds. Ascension also added a 400% role bonus to Remote Shield Booster range, as well as the ORE Mining Director Mindlink, which boosts both Mining Foreman Bursts and Shield Command Bursts. These additions allow an Orca to better defend its fleet in the event of either unexpectedly powerful belt rats or hostile pilots. As noted above, the bonus to Tractor Beam range makes the Orca adept at pulling in jetcans or wrecks to a central location, rather than having haulers slowboating around belts to scoop them up themselves. Or even worse, requiring mining ships to haul their own ore back to station. Instead, the Orca can serve as the single warp-in point for the mining fleet's haulers. Another advantage of the huge range on the beam is that the orca can pull in cans when a can flipper is in the system. Don't forget that if the Hulks / miners remain within 2500m of the Orca then miners can drop the ore directly into the fleet hangar completely removing the risk of theft. When combined with its large drone bay and range bonus to Remote Shield Boosters, the Orca's drone damage bonus allows it to defend a mining fleet from most belt rats almost single-handedly. Further, an Orca can bring a flight of salvage drones and forgo fitting a Salvager module, freeing up a high slot. Store combat ships in the hangar, should the op be working in a lower sec area with tougher rats. Use a survey scanner to find and mark the biggest asteroids in the belt, so that people can focus on the most profitable rocks first. The Orca is an excellent shipping hauler. With sufficient skills and rigs, the combined capacity of its holds can be increased to the point that an Orca is capable of having one of the largest capacities in the game, exceeded only by freighters. This is especially apparent when transporting ore. Further, the Orca's large number of mid slots allows it to fit one of the most effective tanks among hauling ships. In wormholes, an Orca can provide a group with a mobile platform for refitting, swapping ships, storing loot, and repairing. Many corps set up POSes or Citadels to serve these functions, but the Orca does not require the logistics that keeping a POS or Citadel fueled and online would. When fitting an Orca for wormhole use, fit Remote Shield Boosters or bring maintenance drones, and fit a cloaking device. Stay cloaked and aligned in a safespot until needed. Uncloaking should only be done when there are no ships in the system outside of your fleet. Running two accounts in missions, one of which is flying an Orca, can be helpful. In combat missions, you can provide non-mining command burst bonuses to your other character, and tractor the wrecks to a central point while the other character fights. Clear the room, and then head back to the orca to get your salvage ship, or refit your combat ship right in space. Since all the wrecks are already together, you can fit 8 salvagers instead of the usual 4 salvagers + 4 tractor beam configuration, and quickly salvage everything. For mining missions, the benefits are obvious. You can semi-afk your way through the mission and never be in danger of your can expiring. Occasionally you may get a courier mission that requires a huge amount of storage for hauling, particularly some of the storyline courier missions. Instead of needing a freighter, or making multiple trips, the orca can fit the bill. Suicide gankers, canflippers and ninja-looters can use Orcas as mobile bases. They can hold all the loot that they’ve gotten through suicide ganking or other means, and they can provide a nearby platform for switching and refitting ships when needed - even during combat, and often as a bait-and-switch tactic. Outlaws, meanwhile, can enter highsec in a pod to avoid NPC aggro and pull a ship out of an Orca's bay when needed. Mining Foreman V (2x) - Increases duration of Mining Foreman Burst effects by 10% per skill level. Mining Director V (5x) - Boosts the strength of Mining Foreman Burst effects by 10% per skill level. Required for Mining Foreman Mindlink and ORE Mining Director Mindlink. Shield Command V (2x) - Increases duration of Shield Command Burst effects by 10% per skill level. Shield Command Specialist V (5x) - Boosts the strength of Shield Command Burst effects by 10% per skill level. Required for ORE Mining Director Mindlink. Cybernetics V (3x) for the Mining Foreman and ORE Mining Director Mindlinks - 25% increase to the strength and duration of Mining Foreman Bursts (and Shield Command Bursts with the ORE Mining Director Mindlink). When looking at time to train vs. benefits received, Industrial Command Ships V can be saved for last. Depending on mapping and implants, Industrial Command Ships requires more than 30 days to train from level IV to level V and provides the smallest bonus to the Orca's capabilities. Additionally, levels in Leadership, Wing Command, and Fleet Command can be helpful depending on the size of the mining fleet and belts. This page has been accessed 330,002 times.